I have sold a property at 2479 47TH AVE W in Vancouver. NO HST! This is the highest quality 33' family home on the Westside today. Custom built for the current owners by European builder with superb attention to detail. Euroline windows, gorgeous oak floors, 100% wool carpets, low VOC paint and rainscreened. Custom mill work, solid wood doors and hand made tiles. The chimneys are real brick and there is custom leaded glass in the family room and stairwell. Enjoy the sumptuous master suite, walk in closet and bath. Double sinks, oversized shower and stand alone tub all in marble and glass. The main floor has beautiful and bright living and dining. There is a large kitchen with massive honed granite island, Viking 36" six burner range, Thermador fridge and Bosch dishwasher. The eating area and family room are adjoining. Built-ins include a home computer desk, sound system and vacuum. Downstairs is the 4th bedroom, a recroom and 4 piece bath. All in the heart of Kerrisdale on a quiet street with easy access to schools, shopping, downtown and YVR. YOU'LL LOVE IT! I have sold a property at 446 48TH AVE E in Vancouver. This is a great, character style home on a beautiful tree lined block in the heart of Fraser. Oversized south backyard 43.83 x 147.47 RS-1 zoned lot. The house is in original condition but has large principal rooms and wood floors.Renovate, hold, build. Lots of potential here! On one of the best streets in the neighbourhood. You'll love it. I have sold a property at 2406 1239 GEORGIA ST W in Vancouver. "VENUS" 24TH FLOOR STUDIO. Ideal starter, investment or pied-a-terre. Bright and cozy with a balcony and wonderful outlooks. High above all that downtown has to offer. Shopping, restaurants, parks and entertainment. Very effecient layoutwith murphy bed. Parking, storage, gas fireplace, great building. Walk to the marina and your Coal Harbour lifestyle. Furniture available to be included at this price. YOU'LL LOVE IT! Please visit our Open House at 446 48TH AVE E in Vancouver. I have listed a new property at 446 48TH AVE E in Vancouver. VANCOUVER, B.C. – May 2, 2012 – Home sale and listing activity has maintained a consistent pace on the Multiple Listing Service® (MLS®) in Greater Vancouver in recent months, which has helped create balanced conditions for the region’s housing market. The Real Estate Board of Greater Vancouver (REBGV) reports that residential property sales in Greater Vancouver reached 2,799 on the Multiple Listing Service® (MLS®) in April 2012. This represents a 13.2 percent decline compared to the 3,225 sales recorded in April 2011 and a decline of 2.6 percent compared to the 2,874 sales in March 2012. April sales were the lowest total for the month in the region since 2001 and 16.9 percent below the 10-year April sales average of 3,369. “Although April sales were below what’s typical for the month, we continue to see, with a sales-to-active listing ratio of nearly 17 percent, a balanced relationship between buyer demand and seller supply in our marketplace,” Eugen Klein, REBGV president said. 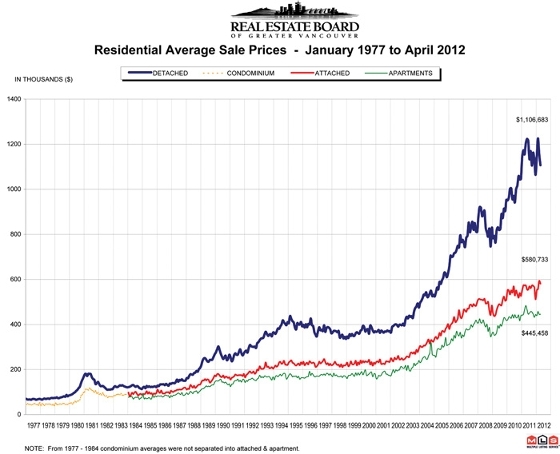 New listings for detached, attached and apartment properties in Greater Vancouver totalled 6,056 in April 2012. This represents a 3.6 percent increase compared to both March 2012 when 5,843 homes were listed and April 2011 when5,847 homes were listed for sale on the region’s MLS®. Last month’s new listing total was 6.7 percent above the 10-year average for listings in Greater Vancouver for April. At 16,538, the total number of homes listed for sale on the region’s MLS to last month and increased 16 percent from this time last year. The MLS® HPI benchmark price for all residential properties in Greater Vancouver currently sits at $683,800, up 3.7 percent compared to April 2011 and an increase of 2.8 percent over the last three months. The benchmark price for all residential properties in the Lower Mainland is $612,000, which is a 3.4 percent increase compared to April 2011 and a 2.6 percent increase compared to three months ago. Sales of detached properties on the MLS® in April 2012 reached 1,126, a decline of 19.7 percent from the 1,402 detached sales recorded in April 2011, and a 17.8 percent decrease from the 1,370 units sold in April 2010. The benchmark price for detached properties increased 6.3 percent from April 2011 to $1,064,800. Sales of apartment properties reached 1,190 in April 2012, a decline of 0.9 percent compared to the 1,201 sales in April 2011, and a decrease of 22 percent compared to the 1,526 sales in April 2010.The benchmark price of an apartment property increased 1.1 percent from April 2011 to $375,900. Townhome property sales in April 2012 totalled 483, a decline of 22.3 percent compared to the 622 sales in April 2011, and a 21.6 percent decrease from the 616 townhome properties sold in April 2010. The benchmark price of a townhome unit increased 1.7 percent between April 2011 and 2012 to $487,300. Please visit our Open House at 2479 47TH AVE W in Vancouver.